The Gym or the Garden? What activity is good for your heart and blood flow, can provide strength for the body, increase flexibility, relieve stress and as a byproduct, produce nutritious food? Why it’s gardening, of course. Gardening uses all of the major muscle groups. It provides those physical exercises that are listed for the prevention of heart disease, obesity, adult-onset diabetes and high blood pressure. It also provides the strength training important in the prevention of osteoporosis. A University of Arkansas study on the risk for osteoporosis, found that besides lifting weights, gardening maintained a healthy bone mass. Even gazing upon the garden can be beneficial to those recovering from illness. In a study in Uppsala, Sweden, 160 postoperative heart patients were asked to look at a landscape, an abstract artwork, or no picture. Those who looked at the landscape had lower anxiety, required less pain medicine and spent a day less in the hospital than the control group patients. Gardeners themselves mention other benefits such as the satisfaction of producing their own produce and flowers, being outdoors, learning about horticulture and using gardening as an outlet for artistic expression. Many gardeners also found a sense of common purpose with their friends when working in community gardens. 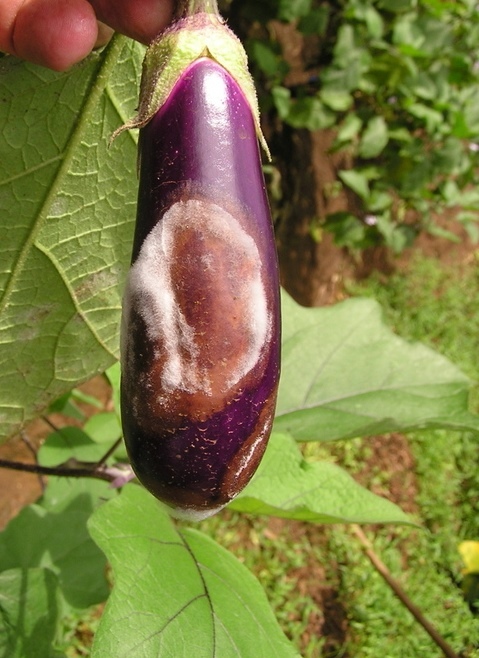 The eggplants can be small to medium size when brown spots appear. Then the spots grow larger and the fruit falls to the ground. You might ask, "What is the problem?" Quite simply, the fruit is rotting due to a fungus disease called phomopsis blight. It is fairly common in a wet environment and is caused by the fungus Phomopsis vexans. Splashing rain spreads this disease. Hot, wet weather increases the problem. In addition to the fruit, leaves and stems can also be attacked along with a dying of seedlings. Severely infected leaves turn yellow and wither. Stems and branches may develop dry, brown, cracked and sunken cankers. Fruit injury begins as a pale, sunken, oval area on the surface. The area will enlarge and become depressed. With one lesion or several spots coalescing, large portions of the fruit will eventually decay. · In areas of high rainfall, planting resistant varieties, if available, is the best control measure. · The phomopsis fungus will survive between crops in plant debris in the soil. Remove and destroy crop residues. It is recommended to wait three years before replanting eggplant, or related crops, in the same area. · Spacing the plants farther apart to allow for better air movement and quicker drying of the plant may help reduce severity of the disease. · Weed control is also advisable since the pathogen can survive on solanaceous weeds such as nightshades. · Lastly, applying a copper based fungicide may help reduce spread of the disease.